Father Leon Alexander performed as Benjamin Franklin for an appreciative audience Friday night at The GRID in Montgomery, the second of the three-part "Howdee, History" series. 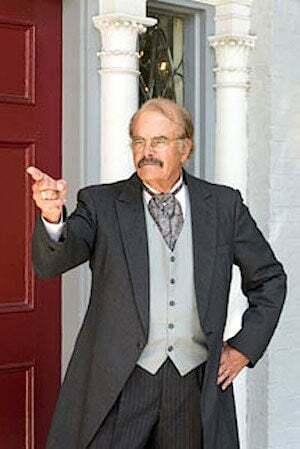 Fayetteville's Gene Worthington will portray President Theodore Roosevelt Friday evening at 7 p.m. at The GRID, as part of The Shakespeare Studio's Howdee, History series. 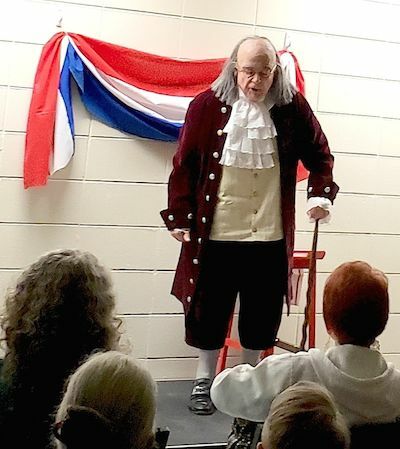 MONTGOMERY — “Howdee, History” continued on Friday with Father Leon Alexander performing as Benjamin Franklin. Alexander, former priest of Immaculate Conception and St. Anthony’s Shrine, brought to life the Renaissance man who played a vital role in the founding of the United States, much to the delight of those gathered at BridgeValley’s The GRID. The three-part series of performances, which kicked off the previous week with Denise Giardina as Minnie Pearl, concludes Friday with Fayetteville’s Gene Worthington portraying President Theodore Roosevelt. Admission is free to the 7 p.m. show, but a $10 donation will be accepted by The Shakespeare Studio, a local community theater group utilizing the shows to gather public support for a future Shakespeare festival in Montgomery. The Howdee, History series is part of a long-running program called History Alive!, which is presented through the West Virginia Humanities Council. More information and ticket sales are available online at howdee.ticketleap.com. Seats can be reserved on the website for free or for a donation. While they last, tickets will also be available at the door. The Shakespeare Studio encourages audiences to grab a bite before the shows at the annual Lenten fish dinner from 5 to 7 p.m. at the Immaculate Conception Catholic Church, located next to the GRID. Dinners are sold at the church for $10 and less. History Alive! 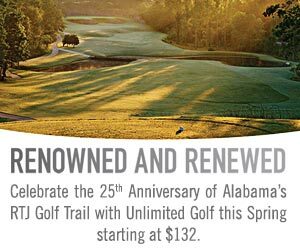 is available to both non-profit and for-profit groups. For more information, call 304-346-8500 or visit www.wvhumanities.org.